We despise mayonnaise but love the creamy and tart flavor from buttermilk and sour cream and the bite from the onion in Ranch Dressing. 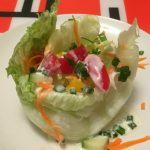 And how great is it on a salad made from crunchy iceberg lettuce, cucumbers, shredded carrots and cherry tomatoes – plus more diced green onions? Well, do with the dressing what you like. 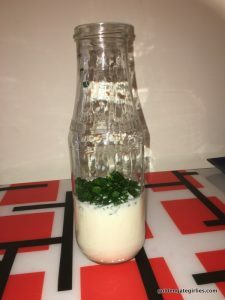 This is a quick version lightly adapted from The Only Ranch Dressing Recipe You Will Ever Need. We have dropped the mayonnaise, and added onion powder and white pepper. To keep it quick and easy, make the dressing straight into the bottle or jar that you will store dressing in. It is best if the dressing has 30 minutes rest time in the refrigerator allowing the flavors to meld. Ranch Dressing - no Mayo! Using a microplane to grate the garlic ensures that dressing will be smooth and that the garlic flavor permeates without leaving behind any chunks of garlic. Chop, grate, measure and mix! In a bottle (or mason jar), pour the measured buttermilk and sour cream. Grate the garlic straight into the jar. Add the Dijon mustard, onion powder, salt and & white pepper. Add the diced green onions, put lid on and shake until all lumps are worked out. Comments Off on Ranch Dressing – no Mayo!